Joan Miró, Agusti Puig and Miquel Gelabert are without doubt Catalan artists, embodying that region’s restless, inventive energy and philosophical questioning. Catalonia’s rich cultural history reaches back to ancient times and its capital Barcelona has been regarded as a nexus of avant-garde activity since the end of the 19th century. These artists, each from a separate generation, call this region home and it provides the foundation for their art. Agustí Puig, born in 1957, studied at the art schools Escola Massana and Cercle Artistic Sant Lluc in Barcelona, but says he learned his real craft in the studios of fellow artists. He focuses on painting, especially large format works, but he also creates ceramics, sculptures, and etchings. Puig had his artistic awakening in the mid-1980s, a period of intense activity in the field of art in Catalonia; his painting presents itself as the heir to the predominant styles in European modern avant-garde art including French and Catalan Oneirism, as pioneered by Joan Miró. Painting in a style known as pintura matèrica in which non-traditional art materials are used and incorporated into the final works; Puig applies paint in a thick and almost brutal manner. Scraping and scarring the canvases, dripping and working with brooms as paint brushes, these very physical methods are freeing and give him a more authentic approach to the creative process and his engagement with the subject of the human figure remains a constant. Puig does not use figurative art merely ornamentally or gratuitously; the figure springs from deep feeling, channeled through an empathetic view of human desire, passion and angst. HIs work is populated by figurative references to people and their quest for realization in a painterly universe reigned over by divided couples, solitary souls, despairing thinkers and ecstatic beings – captured as they labor towards their emotional fullness. Puig’s art seems to reflect a state of duality, even contradiction, appropriate to our own complicated era; his figures seem to wrestle with the question that has occupied man since the beginning of time: What does it mean to be human? Miquel Gelabert, born in 1979, graduated from the University of Barcelona, Spain in 2005 and has subsequently been selected to participate in numerous group and public exhibitions throughout Spain. 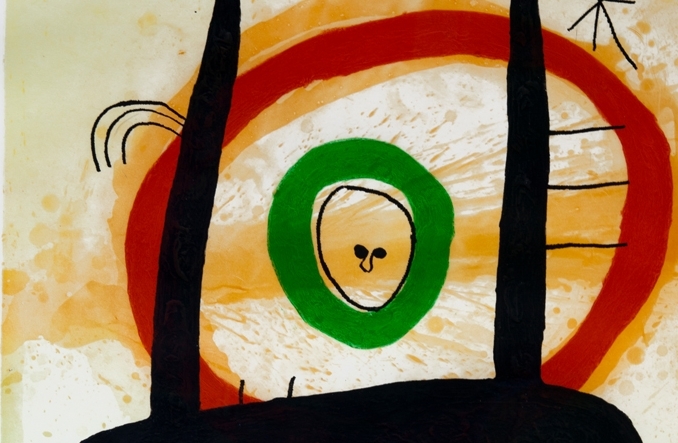 In a short time, Gelabert has distinguished himself among contemporary Spanish artists and their famous ancestors: Miró, Dalí, and Tàpies. He is by trade and vocation - a painter. Not a multidisciplinary artist or a multi-conceptual artist, but a painter –period. Inspired by the international minimalism of Mondrian and Malevich and invigorated by the abstract expressionism of Mark Rothko and Ad Reinhardt, he is not a purist painter in the sense in which modern abstract painting evolved over the course of the twentieth century. Rather than follow the trend of all-encompassing aesthetic distillation, Gelabert achieves his purpose, like all great artists, by finding support in a great tradition, one that exists in Catalan twentieth-century painting. Born in Barcelona in 1893, Joan Miró was one of the most critically acclaimed artists of the 20th century. He pioneered the transformation of the two-dimensional picture plane into a receptacle of personal dreams and imagery, characterized by the suppression of descriptive detail. As a painter, sculptor, ceramicist, muralist, and printmaker, he created a visual vocabulary unique in the 20th century and had an enormous impact on the course of modern art. As a child, Miró spent time in both Barcelona and nearby Montroig), both places steeped in the proud traditions and culture of Catalonia. Catalonia is a province in the northeast of Spain but more strongly influenced throughout its history by France.